1. Preheat the oven to 4750. Line a large sheet pan with parchment paper. 2. In a large mixing bowl, toss the mushrooms with 2 T olive oil and 1/2 t salt. Spread the mushrooms in one layer on half of the baking sheet. 3. 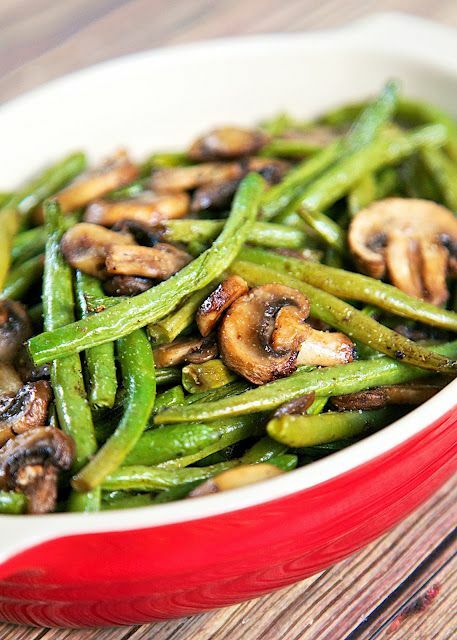 In the same mixing bowl, toss the green beans with 1 T olive oil and 1/2 t salt. Spread the green beans in one layer on the other half of the baking sheet. Roast for 25 minutes, or until the cremini mushrooms are tender, shrunken, and darker brown, and the green beans are wrinkled and browned in spots. 4. Meanwhile, in a small nonstick skillet, heat 1 T and 1 t olive oil with the garlic, rosemary, and red pepper flakes over medium-high heat. Once the oil starts to bubble, turn down to medium-low and cook for a minute to merge the flavors, stirring to make sure the garlic doesn’t burn. Set aside. 5. Transfer the roasted veggies to a serving bowl and toss with the oil.